Mardi Gras Derby winner The Cazadar will be among the 35 Louisiana-bred 3-year-olds entered in Friday’s 400-yard Delta Downs Derby (R) trials at Delta Downs. VINTON, LA—JUNE 12, 2018—The Cazador and Sheza Diamond Diva are among the 35 Louisiana-bred 3-year-olds entered in Friday’s 400-yard Delta Downs Derby (R) trials at Delta Downs. 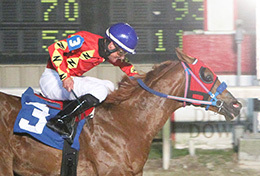 A homebred son of Sir Runaway Dash trained by Michael Zingelmann for owner Rayne Knight, The Cazador has earned $52,578 from four starts this year, and his season resume includes a three-quarter length victory in the 400-yard, $88,000 Mardi Gras Derby (R) at Louisiana Downs on March 17. The colt drew the rail post and will be ridden by John Hamilton in the last of four trials. Shesa Diamond Diva will be making her season debut in the third heat. A gray daughter of Struttin To Beduino trained by Jose L. Sanchez III for owner Crown Horse Racing LLC, the filly ended her 2-year-old campaign with a second-place finish, one length behind winner You Drive I Fly, in Louisiana’s richest horse race, the 400-yard, $1-million Louisiana Million Futurity (RG1) at Evangeline Downs. Shesa Diamond Diva drew post 5 and will be ridden by Eddie Sanchez. The 10 fastest qualifiers will meet in the July 7, $150,000-added Delta Downs Derby final.